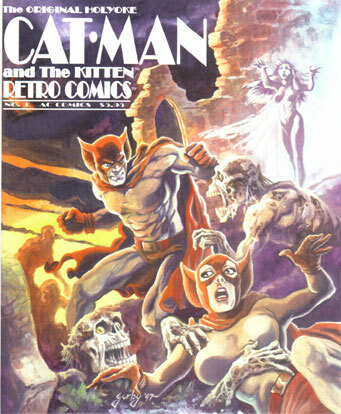 They proved such a hit in the Retro Comics 0 issue, they’re back- Holyoke Comic’s original Cat-Man and Kitten!! And, they star in not one, but TWO newly- created, never-before-seen Retro stories! First, it’s horror in the cemetary, circa 1954, as a mad doctor’s scheme to bring his late daughter back to likfe goes horribly awry, in “The League of the Rotting Dead”. Written by Bill Black, drawn by Black and Brad Gorby, and inked by Mark Heike. It guest stars Fighting Yank, The Panda, and John Carradine. Then, it’s back to the early 1940’s, the days of World War II, and meat rationing. The Feline Furies get mixed up in a scheme to bilk U. S. civilians out of millions, and find an old enemy behind it- Mr. Peccary, in “Hog Wild”, written and drawn by Mark Heike. Then, the vintage offering this volume is another import, this time from Down Under. The American Cat-Man book was so popular in Australia, that when licensed reprints of the Holyoke series ran out, local publishers created their own. Though substantially different in look and concept, it was a decent series that had some success there, do in no small part to the excellent artwork of John Dixon, who became known to American audiences in recent times for his superlative work on books for Acclaum, DC and others. This issue’s reprint is drawn by Mr. Dixon, and entitled “The Skyway Bandits”, and is from the 14 issue of the Australian Cat-Man comic.